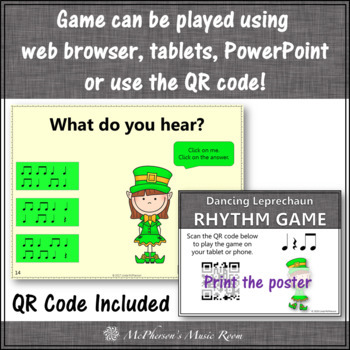 Looking for a St. Patrick's Day Music Game for your elementary music lesson that will reinforce aurally identifying one and two measure rhythmic patterns utilizing quarter note, quarter rest and 2 eighth notes beamed? 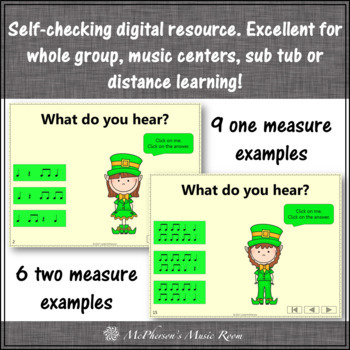 This digital resource is an excellent addition to your March music lesson plans or anytime you are working on the concept. An engaging spring music game for the entire class, music sub tub or music centers! Perfect addition to your Orff lessons and Kodaly lessons. The product is included in a bundle. Click on the bundle link for additional details. Consider purchasing the bundle to save money! The product contains 15 student interactive slides (created with PowerPoint 2013). Each slide has several sound effects and animations. 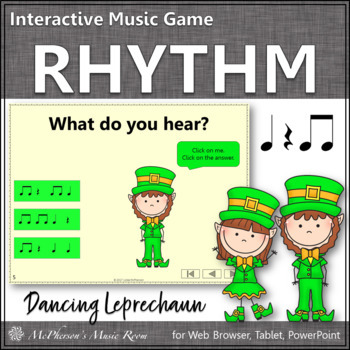 Students will click on the leprechaun to hear a rhythmic pattern. They will then click on the answer that matches the rhythm they hear! 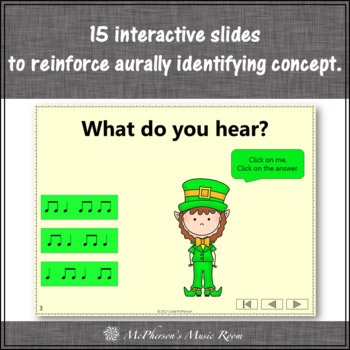 Students will know immediately without leaving the page if they were able to determine which rhythm was played or if they need to listen again. Get ready for a brain break when the students start moving and dancing after selecting the correct rhythm! The product works well with Smartboards! Students just have to touch the board to activate the animations. Interested in additional “Dancing Leprechaun” products? Click HERE. The product was created to be compatible for Mac users using PowerPoint. However, please download the preview as a test prior to purchasing!